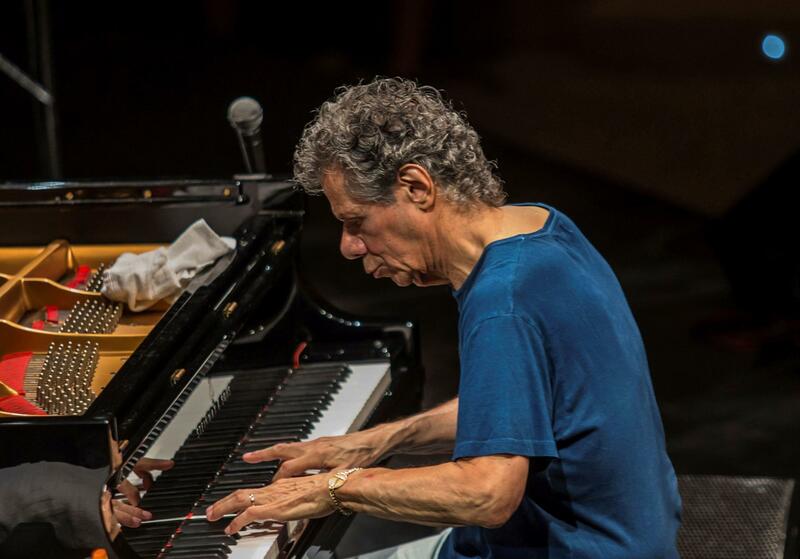 Armando Anthony “Chick” Corea’s musical adventure was already percolating by the time he first touched a piano keyboard at the age of 4. That was when his mom purchased a small upright and it was hoisted — via crane — to their fourth-floor apartment in Chelsea. His dad, also Armando, was an established trumpeter in the world of weddings, coming-out parties, and dances. Musician pals were regular visitors at home, and his dad’s neatly stacked, often-spun pile of 78s included the sounds of Billy Eckstine, Dizzy Gillespie, Bud Powell, Art Blakey, Sarah Vaughan, and Miles Davis. Young Chick was getting and absorbing a music education without realizing it, and when his fingers connected with those ivories, there was a ripple that turned into a drive that became a passion that today, at 77, he still feels. Corea will bring all of that with him when he and his current band, the Vigilette Trio — Carlitos Del Puerto on bass, Marcus Gilmore on drums — play 10 sets of Corea originals as well as Broadway and jazz standards, over five consecutive nights at Scullers Jazz Club, starting Sept. 19. Variety has always been a staple of Corea’s approach to music. Though piano remains his main instrument, between studio settings and live shows, he’s played drums, trumpet, and marimba. His genres have included bebop, mainstream jazz, avant garde, Latin, fusion, and classical. Corea recently spoke about his lengthy career and the upcoming Scullers gigs by phone from his home in Clearwater, Fla.
Q. Did you make your mind up pretty young that you wanted a career in music? A. Once I started playing the piano at 4, and sitting in on gigs with my dad at about 6, and meeting other musicians, I never really thought of doing anything else. It wasn’t like I made a decision to do it, I just never made a decision to do anything else. Q. So, were you the talented little kid who amazed people with your piano playing? A. I did play around town. When I was about 8 or 9 years old, either my mother or my uncle got me a gig at a barroom on the corner of Broadway and Everett Avenue in Chelsea. They had an upright piano, and my mother would bring me there to play. She’d sit by the piano to protect me, I played for about an hour at night, and I’d get a tip or two. That was pretty cool. When I was in high school, there was a barroom a couple of blocks from where we lived after we moved to Everett. I had a funky little trio in there. There was a drummer and an accordion player, and I played trumpet because they had no piano. Q. I didn’t know you played trumpet. A. I played bugle in the St. Rose Scarlet Lancers Drum & Bugle Corps for a couple of years, and I got to play trumpet well enough to play in a big band. But piano has always been my main ax. Q. Wasn’t there a point when you were equally into playing piano and drums? A. Oh, I still am. But when I switched to playing just drums in the 1960s, it was only because I couldn’t find gigs with decent, in-tune pianos. I would be hired for a gig at a bar and the piano would be so badly out of tune that I wouldn’t enjoy it, so I decided to play drums for a year. But once I got the gig with Stan Getz in 1967, and began to play on some good pianos, piano became the main attraction. Q. You’ve headed in so many musical directions. Has there been a plan or have you just gone with your feelings and intuition? A. The plan has always been a simple one for me, which is just keep on making music, and then going with whatever interests me musically. But as I tried out different ways of playing music, I found that composing has become one of my main joys. Q. You’ve played in a lot of trios over the years. How did the current one come together? A. Carlitos and Marcus were the rhythm section of my 2013 band The Vigil. After that band stopped, I started getting some trio gigs, and I would call Carlitos and Marcus to play. We developed a thing and a sound and a feeling and a repertoire. And I’ve known Marcus since he was 12. He’s the grandson of [my former drummer] Roy Haynes, who would bring him to gigs. When Marcus was 14, I was playing with Roy at the Blue Note in New York and he said, “Why don’t you have my grandson sit in and play a tune?” Young Marcus came up and blew me away. Q. Have you put together any setlists for Scullers? A. We did a gig at the Blue Note in Hawaii last February, and we recorded it. I took one of the sets from that gig and made a live recording, and that will be the basis of our repertoire. We might do some of my earlier tunes, like “Humpty Dumpty” or “Spain,” and we’re always doing standards by George Gershwin, Richard Rodgers, and Harold Arlen, or jazz standards by Monk. Q. One more drum question. There are reports that when you’ve played with Jack DeJohnette, you would sometimes sit down at Jack’s drums and he would play your piano. A. He and I have done that a lot. We did a duet gig one time, where we had a solo piano each. He played drums for me and I played drums for him. Q. Do you know if Marcus plays piano and, if so, will there be any switching at Scullers? A. I think Marcus does play piano, but we’ve never tried it, and you’ve just given me a hot idea [laughs].